With Any DVD Cloner Express, you can easily back up any movie DVD to DVD+R/RW, DVD-R/RW disc, make clones of your favorite DVD movies on DVD in just a few clicks.The working copies allow you to play your DVDs on home and computer DVD players every day without the inevitable risk of getting your originals scratched or damaged.You get disc protection with no loss of playback quality. The best EXPRESS choice to make backup copies of movie DVDS. 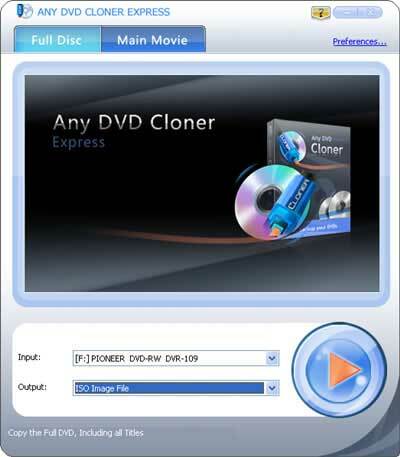 Any DVD Cloner Express allows you to copy entire DVD movie or main movie to DVD or hard drive and shrink DVD9 to DVD5. If you are looking for a simple yet powerful DVD backup software without too many settings, Any DVD Cloner Express is the exact one for you. *Support latest DVD copy protections and newly released DVD movies. *Remove all DVD copy protections including CSS, RC, RCE, APS, UOPs, ARccOS, etc. *Support Full Disc and Main Movie copy modes. *1:1 ratio copy to make a perfect clone just as your original DVD. *Shrink DVD with minimum video quality loss. *Support DVD to DVD, DVD to DVD folder, DVD to ISO. *Support DVD-R / DVD-RW / DVD+R / DVD+RW burners. *Support both NTSC and PAL DVD movies. Qweas is providing links to Any DVD Cloner Express 1.20 as a courtesy, and makes no representations regarding Any DVD Cloner Express or any other applications or any information related thereto. Any questions, complaints or claims regarding this application Any DVD Cloner Express 1.20 must be directed to the appropriate software vendor. You may click the publisher link of Any DVD Cloner Express on the top of this page to get more details about the vendor.